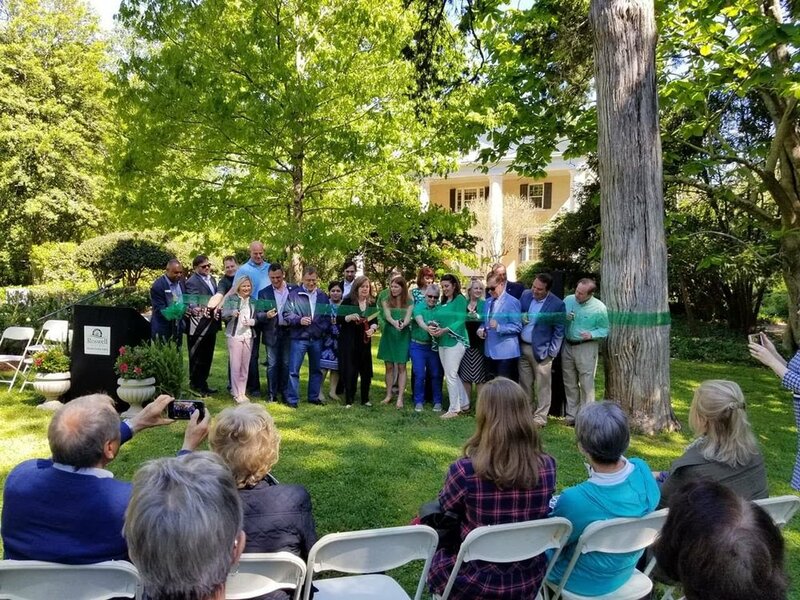 The gardens officially opened on Earth Day - Monday, April 22nd - with a ribbon cutting ceremony! Restoration of the grounds is ongoing, but the gardens are now safe for visitors and available for rental. The grounds are currently open for rentals only, but the City intends to make the space open to the public on a regular basis soon. Friends of Mimosa Hall & Gardens rang in 2019 with a festive Great Gatsby themed benefit gala. 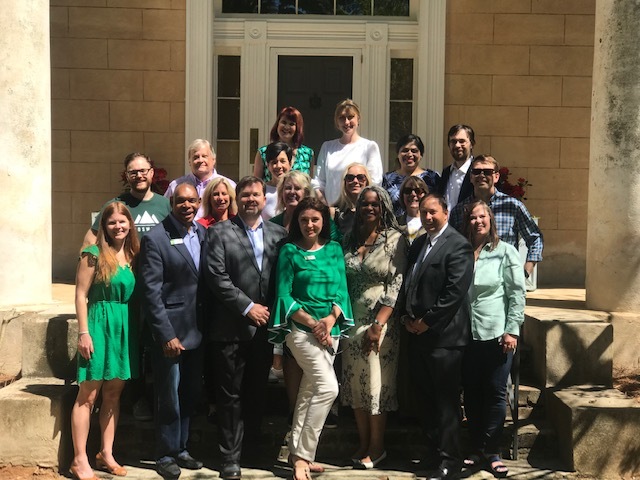 The event, held at the DoubleTree Hotel on Holcomb Bridge Road, joined together Roswell and Greater Atlanta citizens to generate excitement for the upcoming opening of the historic Roswell property. The gala featured live 10-piece band 120 East, who played a full set of both classics and contemporary hits. Other entertainment included a stand-up comedy routine by Todd Callen and speeches by event chair Michelle Slater, president Michael Harris, and former president Steve Gibson. Friends of Mimosa also presented two awards honoring Roswell citizens whose efforts have made a significant positive impact on the Historic District. Ryan Pernice, owner of Table & Main and Osteria Mattone, past president of the Historic Roswell Business Association, and committee member for the Historic District Master Plan, was the recipient of the Phoenix Award. Dotty Etris, retiring Executive Director of the Roswell Convention and Visitors Bureau and founder of the Chattahoochee Nature Center and the Hospitality Highway program, received the Champagne Toast award. Costumed guests enjoyed posing with a 1935 Jaguar, parked at the hotel’s entrance for the evening. Feathers, beads, and a Great Gatsby photo booth further added to the ambiance of the roaring ‘20s. At our Great Gatsby New Year’s Eve Gala, we will be presenting awards to honor two individuals who have made a significant positive impact on Roswell. Read our Press Release here. We are looking for an upper-level undergraduate or graduate student in History, English, American Studies, or a related field, to intern with us part-time in the Spring semester. For more information, please see the posting on our Volunteer page. Our Communications Director, Dr. Sara Harwood, will be speaking about Mimosa Hall at the 2018 Slave Dwelling Project Conference in Murfreesboro, TN this October. The Slave Dwelling Project, a 501(c)(3) nonprofit organization, assists property owners in preserving and interpreting extant slave dwellings. The organization is well-known for operating "Overnight Stays" and interpretive programs in historic structures. The conference brings together stewards of historic properties, students, faculty, and practitioners of public history. Dr. Harwood is looking forward to sharing the research that she has done on the enslaved persons who lived at Mimosa Hall. Mimosa Hall is going solar! Friends of Mimosa Hall & Gardens is fundraising to install a proprietary thin-paneled solar roof on the house, which will lower the City of Roswell's energy bill by $5000/year and make Mimosa the oldest Net Zero building in the country. Please CLICK HERE for more information on this exciting project! Simone du Boise, the genius behind the roof design, spoke with Michael Litten on Ride the Vibe about the project and her background in architecture. CLICK HERE to listen. Steve Gibson, the first president of Friends of Mimosa, spoke about the project on Yale Climate Connections. CLICK HERE to listen. Friends of Mimosa Hall & Gardens release position papers. To view each pdf, click on the following subject. In April 2018, Friends of Mimosa appeared on WSB-TV's "Georgia's Hidden Treasures." Click below to watch the clip! Click below to hear Michelle Slater discuss Mimosa Hall & Gardens and The Friends on Positively Roswell Podcast. For more news from Friends of Mimosa Hall & Gardens, please sign up for our e-newsletter below.